On this episode of Working: Syracuse, we speak to Dan Meates, a zookeeper at Rosamond Gifford Zoo. When the zoo was founded in 1914, just a handful of animals called the four-acre facility their home. Now, more than 700 diverse species reside in the zoo's 43 acres. As a general curator, Meates oversees specialized zookeepers who care for the expansive variety of species. But all who work at the zoo consider animal conservation the primary goal of their work. That goal is shared by a small portion of the 1,500 zoos that exist around the globe. The Rosamond Gifford Zoo is one of 232 zoos that are an accredited member of the Association of Zoos and Aquariums (AZA), which promotes participation in several programs dedicated to animal conservation. The Rosamond Gifford Zoo promotes a Species Survival Plan (SSP) Program and participates in more than 500 worldwide SSP Programs to conserve threatened and endangered species. In fact, the zoo is among the top 10 percent of USDA-recognized wildlife exhibitors and is nationally recognized for its Asian elephant breeding program. It also works on research programs for native species in the wild such as the Chittenango ovate amber snail, an endangered snail only found at Chittenango Falls State Park in Chittenango, N.Y., 22 miles southeast of Syracuse. While the Rosamond Gifford Zoo takes its conservation efforts seriously, it also works to fund engaging programs that connect the zoo with the Syracuse community, hosting year-round events for members and non-members alike such as immersive summer camps for children aged 3 to 14, behind-the-scenes "Twilight at the Zoo" adult programs, and popular events such as Brew at the Zoo, an annual fundraising event that features regional beers, wines, and food. 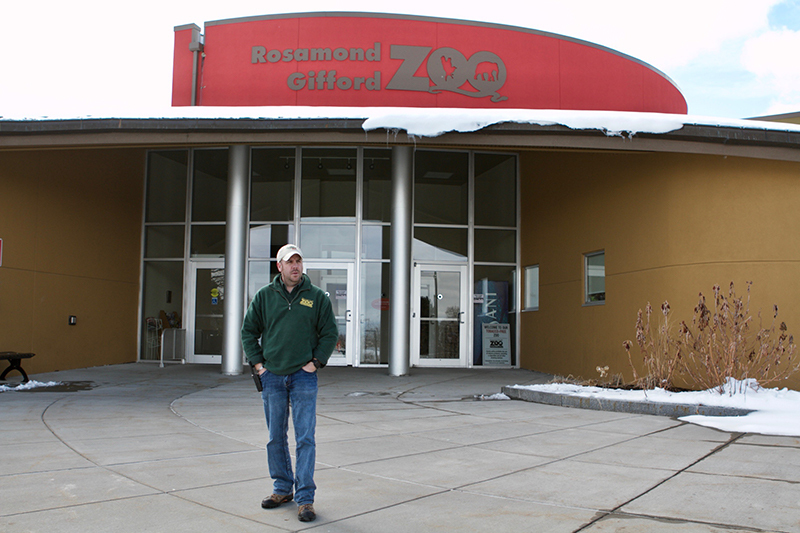 Daniel Meates, 41, serves as the general curator at the Rosamond Gifford Zoo and says he has been a zookeeper for more than half of his life. Meates stands at the entrance of the Rosamond Gifford Zoo, which boasts more than 370,000 visitors a year and serves as home to more than 700 animals. Meates says he was hooked from the first time a hawk landed on his arm in middle school. 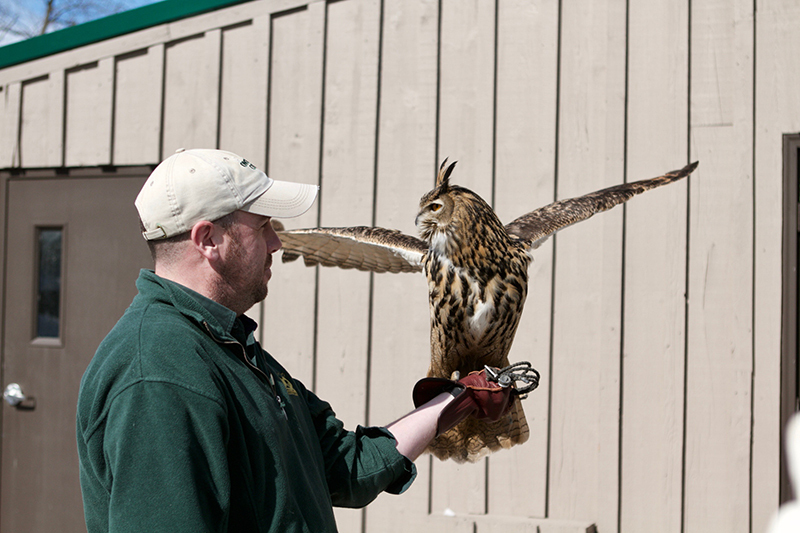 "It's a completely different experience to see this bird, free flight, as it flies towards you and lands on your arm," Meates, who works here with a Eurasian eagle-owl, says. 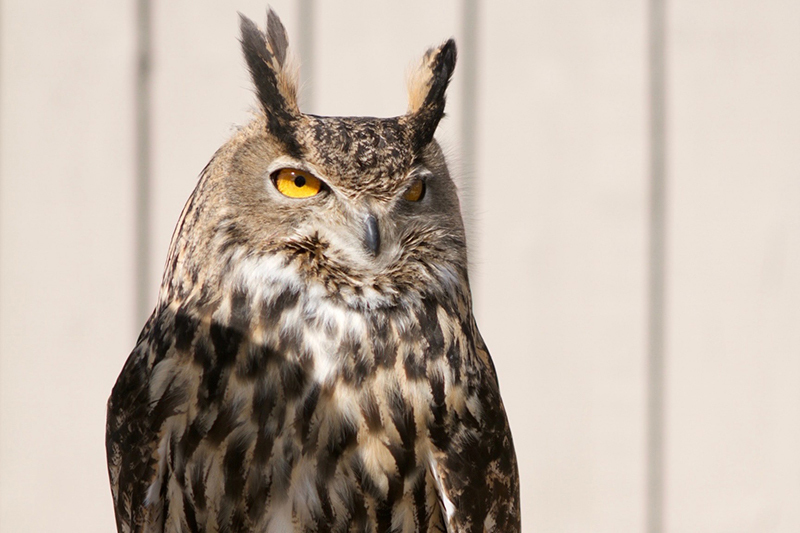 The Eurasian eagle-owl's amber-colored eyes aren't its only unique feature. Its distinct vocalizations, including a deep "ooo-hu," allow it to be recognized by voice alone. With a wingspan of five to six feet, the Eurasian eagle-owl is also known for its considerable appetite and can consume a whole fox. "That's a regular animal on the prey menu for this species," says Meates. BRONTE SCHMIT, HOST: Hello and welcome to Working: Syracuse, the podcast inspired by journalist Studs Terkel featuring Salt City residents talking about what they do to earn a paycheck and how they find meaning in those jobs. I'm your host Bronte Schmit. The Rosamond Gifford Zoo is a 43-acre zoo that hosts more than 700 animals. It has been an accredited member of the Association of Zoos and Aquariums since 1987. 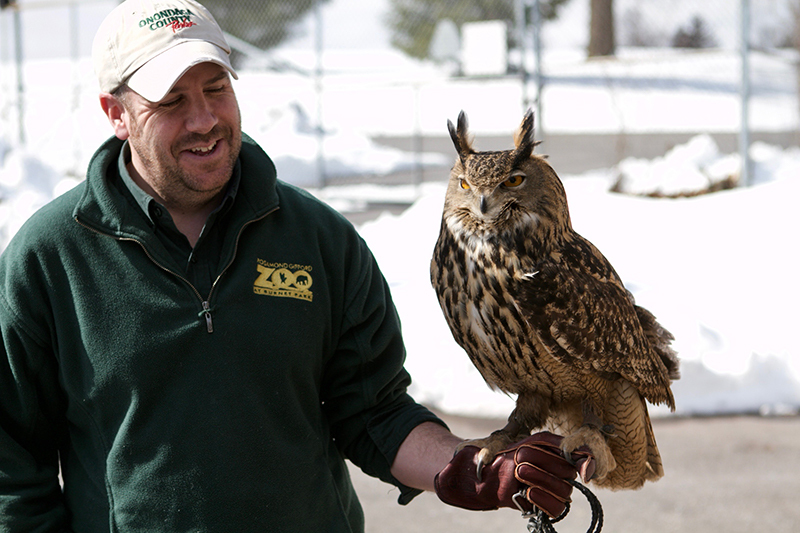 Our reporter Tess Berger interviewed Dan Meates, a 41-year-old curator at the establishment, about the ins and outs of Syracuse's zoo. TESS BERGER: As Dan Meates escorts Eagon the Eurasian Eagle owl from his enclosure, a playful smile spreads across his stubbled face. The amber-eyed bird clenches its claws onto Meates' leather glove, well-worn from his extensive falconry experience. Although Meates loves working with falcons, what keeps him going is the staggering decline in animal populations throughout the world. DAN MEATES: A lot of the species on our planet are disappearing pretty quickly, and I wanted to make a difference. And this is one of the best ways in conservation that you can make a difference — working in the zoological field. Hi, I'm Daniel Meates and I'm general curator at the Rosamond Gifford Zoo and I've been working in zoos and field biology for 20 plus years. TESS BERGER: Dan Meates has been a zookeeper for half his life. Born and raised in Wales, his job has allowed him to travel all over the world studying endangered species. From New Zealand and Europe to California and New York. But if Meates hadn't trusted his passion, he might not be where he is today. DAN MEATES: It was funny enough, actually we had an education officer come to the schools, a career officer rather, and they would talk to you about your strong points and your strong subjects in school and what you would like to do professionally for the rest of your life. And I still remember until this day, I was talking to the individual and I told her that I wanted to be a professional falconer and work in the zoo conservation field. The best way I can put it is I was slightly laughed at. TESS BERGER: But the idea of picking another job never crossed Meates's mind. The passion had already taken over by the time he was just 10 years old. After a successful class presentation on raptors, Meates' teacher rewarded him and a friend with a trip to the local falconry center. DAN MEATES: And I called a Harris hawk out of the tree to the glove and I think that's where it set in. Right there. It's a completely different experience to see this bird, free flight, flies towards you and lands on your arm. I was hooked from there I would say. So I was about 10 or 11 years old then. And the best way to put it, I kept being annoying and was bugging everyone that was in the raptor field to get my foot in the door. And so I did. I managed to get into the Barn Owl Project and help with that. TESS BERGER:The Barn Owl Project was Meates' big break into the zoology world. Barn owls are an endangered species in the United Kingdom, so Meates' project was a breed and release program focused on the replenishment of the species' population. It's a job that requires intense dedication to ensure that the barn owls would stay and breed in the area. The job was no easy task, but it was a very fulfilling experience for Meates, who said his favorite part of the job was the release. DAN MEATES: Getting to see birds that you've been a big part of from hatch grow all the way up and then you release them out in the wild and then they actually stay in the area and have offspring of their own. That's incredibly rewarding. TESS BERGER: While rewarding, Meates says, it's not your typical desk job. Oftentimes, he gets to play matchmaker. Meates recently introduced Abe the siamang ape to his new companion. But according to Meates, there's no guarantee the relationship will work. It's unpredictable — just like many facets of Meates' job. 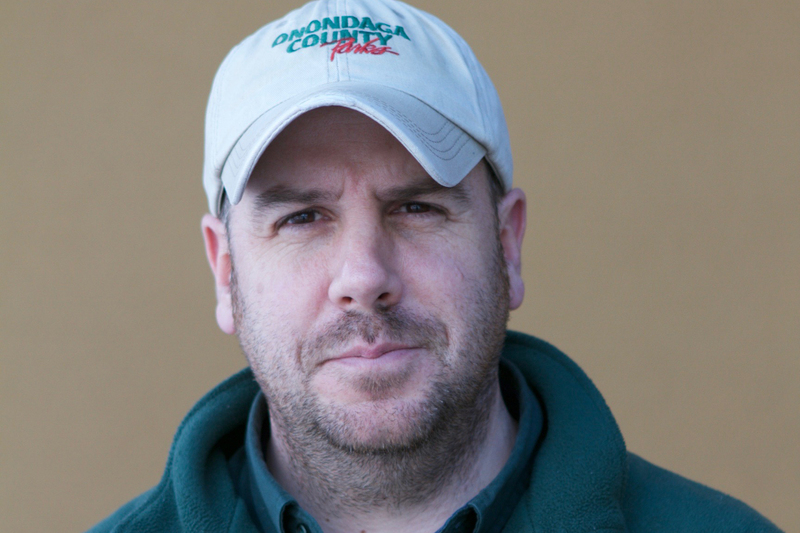 DAN MEATES: So even when I do leave the zoo, it doesn't mean my day is over. Sometimes I have to come back. Or you know if an animal is giving birth for instance, they won't do it nine to five. They could be giving birth in the middle of the night, in the early hours of the morning. So my job is consistently ongoing. My cell phone doesn't leave my side. So we're constantly so to speak, you're constantly in work if that makes sense. I'm not complaining about it because I really enjoy it. TESS BERGER: But it isn't always the work that many of us think of when we hear the word zookeeper. Meates was adamant about dispelling some of the myths around what zoos are and what zookeepers do. DAN MEATES: The misconception with zookeepers is people think they just clean the exhibits and feed the animals, and that is in fact the smallest part of their job. TESS BERGER: In fact, most zoos have become what Meates likes to call arcs. As in Noah's Arc. But one for the 21st century. DAN MEATES: We actually breed species in part of what we call SSPs. And SSPs stand for species survival plan and so what we do is basically we're breeding species with the best genetics we possibly can so if a wild population was to crash, we have genetically superior animals that we are able to release back out into the wild to get those populations back up. TESS BERGER: Some of the animals at the Rosamond Gifford Zoo are part of international SSP programs across the world, a system managed by the Association of Zoos and Aquariums, or the AZA. The AZA is a non-profit organization that represents more than 230 institutions in the U.S. and overseas, and manages nearly 500 SSP programs. The Rosamond Gifford Zoo participates in SSPs for both threatened and endangered species, including the Asian elephant and red panda. DAN MEATES:Most of the zookeepers here will have a minimum of a bachelor's degree in one of the science fields, including biology or zoology. A lot of zoos now are leaning towards looking for a master's in order for you to get a keeper position. You need to know the anatomy of each of the species, you need to know the nutritional intake. You need to know breeding behaviors, you need to know introductions of animals. It's an ongoing process. TESS BERGER: But just as fortunate as he is to provide species with life, he is also tasked with handling death. His voice lowers and a solemn expression flashes across his face. DAN MEATES: As you can imagine it's very hard for the keepers. It's no different than one of your long term pets from home passes away at home. It's very much the same for us. We spend day in and day out with the animals so you do build a bond. Yeah, it can be extremely upsetting as you know when an animal is coming to the end of its life but we make sure we make the right decisions as you would do for your pet at home, we're the same. The animals these days in facilities get state-of-the-art medical care. In fact, in most facilities they get better than what most humans get. As you can imagine species in zoos tend to live a lot longer than they would in the wild now and the longevity is increasing due to that outstanding medical care that they receive. So that's all part of it, but it's something you don't get used to. You always have a bond, so it's hard when you lose one. TESS BERGER: But these relationships aren't to be confused with having a pet. Meates has learned not to let himself get too attached to his animals, knowing that at any moment, the SSP program could move them to another zoo thousands of miles away. While he tries to keep his emotions in check, forming a special bond from time to time is inevitable. DAN MEATES: I'd be lying if I said no. We hand rear a lot of species here, if something comes up we do a lot of hand rearing. So when you're hand rearing an animal, you know, from birth all the way up to adulthood, you know, there's an attachment there. But you still just gotta try and take that step back, because you know they're gonna move on to a different facility to be a part of that bigger picture, those breeding and conservation programs, so. That's what I always try and keep in the back of my mind. TESS BERGER: Meates has enough pets not to get the two confused. He chuckles as he prepares to list the pets within his home. DAN MEATES: My wife she's a herpetologist so we have a lot of dart frog species. I have four dogs, I have a cat and two tortoises. Different species. TESS BERGER: Though Meates says 50 years down the line he should be retired, he hopes to continue his job for as long as possible. DAN MEATES: I'll always continue in this field. Even if I have to adjust the way I do things because obviously this is a very physical job. But even if I have to make adjustments there I will always continue in this science field with conservation efforts in this biology field. It's me. This is what I enjoy doing. This is what I live for. BRONTE SCHMIT, HOST: Thank you Tess for sharing Meates' story. Meates and his wife are both in the zoo field, and recently took in a baby chick that was pushed out of its nest in the zoo's diversity exhibit. The two take turns feeding the chick during the workday, and sometimes they need to cover for each other. BRONTE SCHMIT, HOST: That's all for this episode of Working: Syracuse. Check out our website www.workingsyracuse.com for more interviews and extra content about Meates. Be sure to follow us on Facebook and Twitter @WorkingSyracuse. Thanks again to Tess for speaking with Meates. This is episode was written by Tess Berger and Alexis Jones. The episode was produced by Will Muoio. Extra reporting came from Julianna Whiteway. Our theme music is by Logan Piercy. I've been Bronte Schmit, and it's time for us to clock out.